GOT LUAU? Why not wear a colorful faux silk leafy floral orchid lei, and brighten up any party! Give thanks to your Hawaiian beach or pool party guests with ‘’Mahalo’’ Floral Leis. Mahalo means ‘’thank you’’ in Hawaiian! Add a touch of the island tropics to any event with these unique flower greenery leis. Fresh Hawaiian style and natural leafy lei creates just the right touch. Liven up any hula or mermaid cosplay costume. Faux silk green leaf fern, colorful assorted color floral leis. Just the right party favors for pirate birthday theme events. Perfect photo booth props! 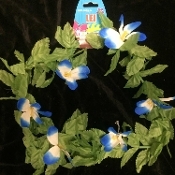 LUAU, MERMAID, HULA DANCER Costume Accessories.